Virtually Connecting is connecting to the Digital Media and Learning Conference in Irvine, California to join into conversations with experts on “cutting edge learning practice and design with a focus on access, engagement, and equity for all young people”. It’s time to get connected to talk about media and learning. You can read more about the conference and see the schedule of speakers. We’re connecting with Justin Reich, Fay Cobb Payton, Henry Jenkins, Esra’a Al-Shafei, Kim Jaxon, Renee Hobbs, Nichole Pinkard and Remi Kalir. Our onsite buddies include Christian Friedrich, Mandy Honeyman and Alan Levine. 1 – Join one (or more) of the Google Hangouts below by tweeting us @vconnecting or leave a comment below. We’ll ask for your email address so we can send you a link to one of the sessions listed below just before it goes live. 2 – Follow our sessions live and engage with us on twitter. 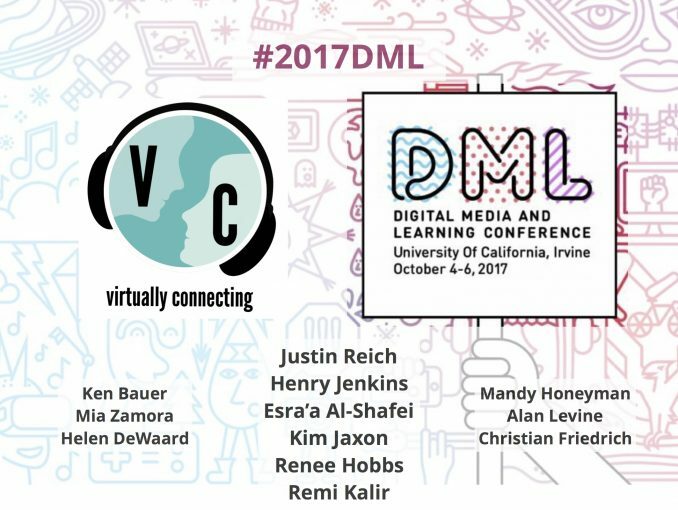 Use the Hashtag #2017DML if you like and make sure to tag @vconnecting and/or one of our session participants. All times are USA, Pacific time. The timezone section below will show you the session time in your local timezone. Thursday, October 5th at 10:30 a.m.
We will connect with onsite guest Justin Reich and Fay Cobb Payton. Our onsite buddy is Christian Friedrich and our virtual buddy is Helen DeWaard. Thursday, October 5th at 1:45 p.m.
We will connect with onsite guest Kim Jaxon. Our onsite buddy is Alan Levine and our virtual buddy is Ken Bauer. This session will include participants from Alan Levine’s MA thesis class from Kean University. Thursday, October 5th at 2:30 p.m.
Helen DeWaard’s MDL4000 students in the Faculty of Education, Lakehead U, Orillia, Ontario. Friday, October 6th at 12:30 p.m.
We will connect with onsite guest Renee Hobbs, Nichole Pinkard and Remi Kalir. Our onsite buddy is Christian Friedrich and our virtual buddy is Helen DeWaard. I would like to attend the session with Henry Jenkins on Oct 5. I would like to register to attend the session with Henry Jenkins on Oct 5. I’d like to particpate! Links can be sent to butler1@kenyon.edu. Sorry for the delayed response Diane. This session was filled early on (with the 10 participant limit within Hangouts). You can watch the recording of this conversation on the Virtually Connecting website. Thanks for your interest in Virtually Connecting. I’m keep to follow some of the sessions happening this evening, would it be possible to get a live streaming link? Also, I’m absolutely gutted but yesterday I wasn’t able to live stream into any of the events, are they going to be posted online for people to watch at a later date at all? That would be so incredible! Can I has invite to last two sessions? Thanks!